Do you perform exceptionally well in practice and then “choke” in games? 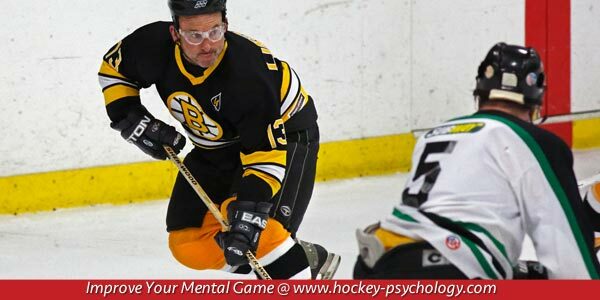 Do you become so nervous and filled with anxiety that you cannot “feel” your stick or blades? Do you become full of self-doubt, worry, and forget plays in big games? You should ask these important questions to yourself. Many good hockey players and other athletes come to me because their game performance is not of the same quality of their practice performance. This is when you know it’s mental. If you can perform well in practice, but can’t take it to games, it is most likely a mental breakdown. The ability to take your “practice game” to competition is critical if you want to be successful in any sport. Most great players are able to step it up in competition compared to practice because of the extra adrenaline they get from playing in games and thus focus improves. If you want to take your game to the next level, practice in conditions that will mimic competition. The best type of practice simulates what happens in the real competition. Many teams do this type of simulation training to get athletes prepared for the real thing. This is what NASA does to train flight crews for space travel. Practice is most effective if you can anticipate the conditions you will be faced with in competition—so you will be ready to cope with anything. Perform like you don’t care. Sometimes athletes handcuff themselves by caring too much about their sport performance, as if it is life or death. In practice, most people don’t have any cares or worries about performance and are able to play free without anxiety. Try less or the same amount you “try” in practice. Make it a goal to be free, natural, and trust your instincts. Have a game plan. Most sports require you have a game plan or strategy for how to approach the competition. Baseball players have an at-bat plan, football teams have a game plan, golfers have a course strategy plan, race car drivers have a race plan, and you too should have a strategy for how to approach hockey games. It may be a simple plan that says you will focus on hitting the open man on offense. Game plans can be simple to the more complex. Make as many decisions as you can ahead of time because good decisions are hard to come by in the heat of competition. Do not expect to “choke.” I am convinced that a person’s expectations can have a huge impact on their performance. If you go into a game knowing that in the past you have choked and may do it again, you are done before the puck drops. I call this a self-limiting expectation. Based on a few past events, you generalize that this is ALWAYS the case, especially if you have a shaky or poor first shift. Visualize or see yourself playing well and strive for success instead of trying to avoid making mistakes.